Autism spectrum disorder (ASD) is very commonly diagnosed these days, possibly due to increased awareness. Or are these signs that the human brain is developing in new and different ways that have yet to be understood? What have advances in our understanding of the etiologies of ASD taught us about its mechanisms, and can they shed light on the evolution of the human brain? 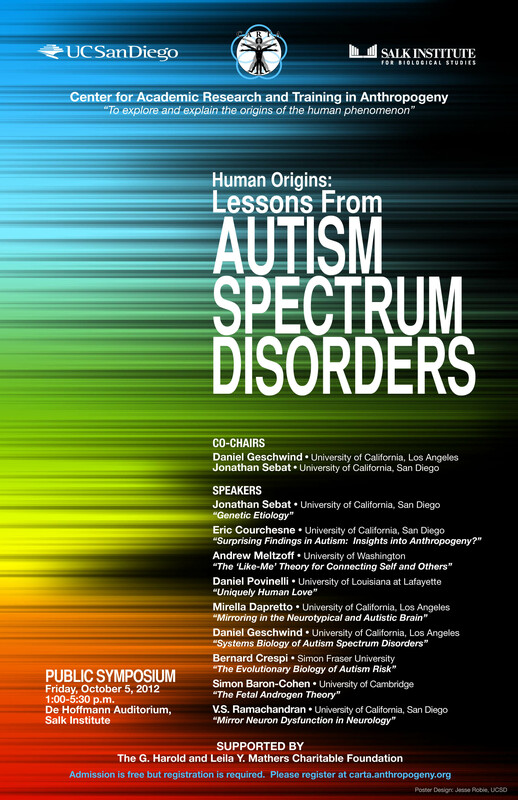 The CARTA public symposium on “Human Origins: Lessons from Autism Spectrum Disorders” featured scientists from many diverse fields, including genetics, neuroscience, psychiatry, cognitive science, psychology, and evolutionary biology, who shared their insights into ASD--providing a multi-disciplinary perspective on this multi-faceted spectrum of disorders, and its implications for understanding human origins and the evolution of the human mind.